We are renowned for the production of superior quality collection of Human Machine Interface, which are widely used in various industries. These machines are manufactured using the quality approved raw materials and high-tech technology to ensure high performance, compact design and smooth operations. We offer our clients superior quality of Human Machine Interfaces (AE Series) which are adequately designed by our diligent and dedicated professionals to meet the needs of clients’. Our products are available at effective costs and they adopt excellent extension designs. Moreover, they are developed from excellent technology and fulfill the demanding requirements of users. Furthermore, our products can be availed in models of 5.7", 8.0" and 10.4" display with monochrome and multiple colors. 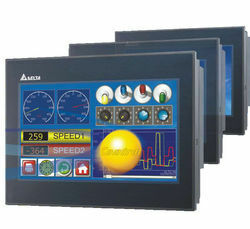 Touch screens comply with IP65 / NEMA4 standards. These products are utilized in industrial monitoring systems, such as HVAC, Printing Machine, Exposure Machine and Product Line Monitoring Equipment. We are the leading supplier of a variety of industrial automation products in COIMBATORE and also serves in regions like TRIPUR , ERODE, SIVAKASI, NAGERKOVIL, TRICHY, SALEM, CALICUT, TRISSUR, COCHIN, ERNAKULAM, PALAKKAD, TRIVANDURAM. Display Sizes : 4.3", 5.6”, 7", 10" Inches. Memoery Capacity : 128 Mb. External Card Slot : Sd Card, Usb Port. 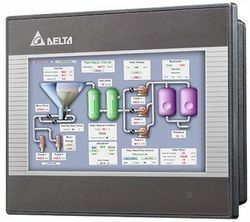 Communication : Rs232, Rs485, Ethernet, Modbus, Profibus.